Yay, it's Friday!! You get a Friday and you get a Friday, everybody gets a Friday! I love hanging out with the ladies from the 5 on Friday! Here are 5 things I am loving lately! I love my new First 5 app. It is an App, run by Proverbs 31 Ministries, that has a small devotional devoted to the first 5 minutes of each day. As a quote lover, I also love that each day starts out with a quote like the one above. You can set your alarm through the app so that, upon waking up, there is a reminder to open the devotion of the day. It's purpose is to devote the first 5 minutes of each day to God. I had been looking for something that would hold me accountable of that. So often I would wake up and lay in bed for who knows how long and the first thing I would do is pop open Instagram or Facebook. 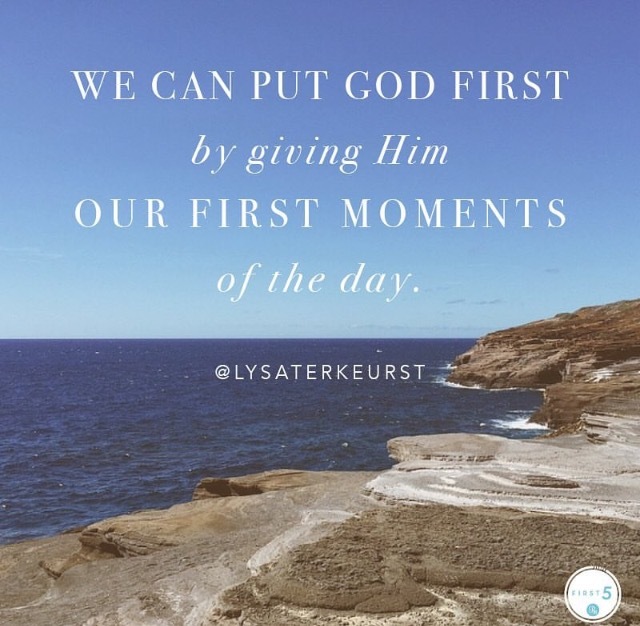 I wanted something to do that would put my focus on a moment with Jesus before I did anything else. I tried it on my own, to just spend a moment in pray before my feet got out of bed, but there were many days I wouldn't. So far I am 4 for 4 with the First 5 app and I hope it stays that way. Not only does it help me focus my mind and heart on Jesus, but it has also helped get me out of bed and going quicker. I feel refreshed and ready to start the day, have a little breakfast and then sit down for more intentional devotion time and a less early morning brained mind. I love it! And it's free! So you should try it! I finally introduced Babe to Trader Joe's! And we finally decided to try the whole freezer, stove-top meal thing instead of constantly eating out or picking something up (or eating cookies for dinner, who am I kidding?!). We LOVE the asparagus risotto! We ate it alone this time (so that we could have cookies after dinner; I think my cookie obsession is getting out of hand) but next time plan to pair it with some chicken breast. If you haven't tried it yet, you should! It is delicious! I feel like I can't do a post these days without mentioning how much I love Flo! I am so excited for our first big journey this weekend! We have our 'things to do' planned for our time in St. Pete, but we could use a little help with the 'where to eats'. Anyone know of any good lunch restaurants in the St. Pete/ Clearwater beach area? Think local, fresh flair. NOT going to the Apple Store! So, my new phone decided to just randomly quit on me. Just like that! Nothing wrong, just went dead. For over 6 hours!! I figured I was done for. I went to Verizon, but they couldn't do anything because it was past the 14 days. They said my best bet was to go to the Apple store and hope they could fix it, but that if not the Apple store could give me a new phone on the spot. I was actually thinking about going all weekend without one; horror of horrors, I know, but I didn't want anything taking time away from Flo's maiden voyage. Actually, a day without a phone was really nice and I was almost looking forward to a whole weekend without it. But then, I got home last night, tried the button one more time and voila, it was working. I don't know. I am just hoping it doesn't happen again. I love freebies and I love my oils. I have been using Young Living oils for almost 6 months now and love them. I use them everyday. I don't talk about them on here often because this space isn't really for that. 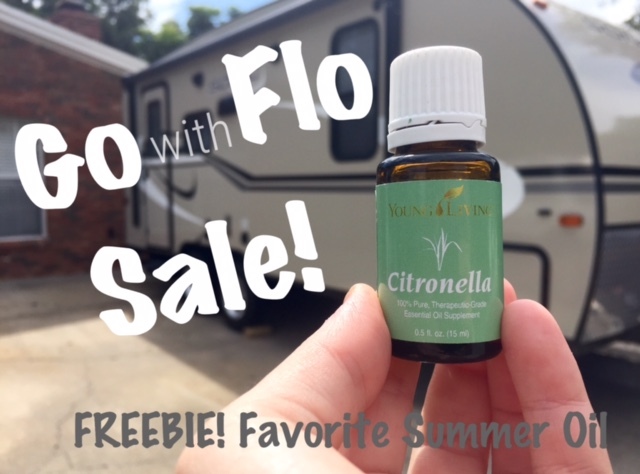 But, in honor of Flo's first weekend leaving from home and her excitement about her new "no bugs" oil, she wanted to offer up a sale and figured I should share with you what I am sharing with my friends and family at home. So, if you have ever thought about trying essential oils now is the time. The starter kit is already on sale and I am offering one of my favorite summer oils for free (deal goes through Sunday)! Choose from either Citronella (to keep all those 'squitos away) or Grapefruit (tastes delicious in water and helps curb cravings/ kick up metabolism). Feel free to email me with any questions or if you want to jump right in you can order here (member number 9759174). And with that I am off!! We are pulling out of the driveway in 5 minutes to embark upon Flo's first big adventure! Fort DeSoto here we come!! Have a fabulous weekend y'all!! I hope you guys had a great time at Fort DeSoto this weekend! I can't wait to hear about it. I am a little late to give any recommendations for restaurants... but I don't really know that many in the St Pete Beach area anyway. Happy weekend!